The main functions of node's selection and positioning are available via the Positioning panel. All available controls for selecting and positioning nodes can be found on the Nodes tab of the Editor Hotkeys settings. To select a single node in the scene, choose on the Positioning panel and click the left mouse button on this node. In this case, only the mesh surface which you have clicked will be selected. 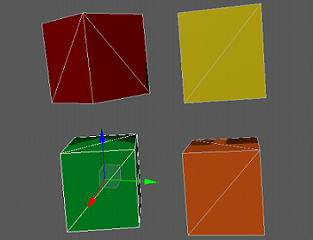 To select several mesh surfaces, holdShift and click required surfaces. You can convert the selected node to a NodeReference by pressing Ctrl+Shift+G (or click Edit -> Convert to NodeReference). Use the selection box: click and hold the left mouse button, drag the mouse to select the required nodes. 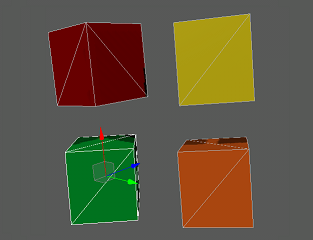 In this case, all surfaces of each mesh (if it exists) will be selected. Window Mode requires the whole object to be inside the selection box. Crossing Mode makes the object selected even if its part is inside the selection box. Select one of the nodes, press and hold Shift to add nodes to the selection and Ctrl to remove. To select all nodes in the world, press Ctrl+A. To remove nodes from the selection (deselect), press and hold Ctrl and click the left mouse button on the required nodes. To deselect all the selected nodes, press Ctrl+Shift+A. The selected nodes can be positioned in the world by using one of the ways described below. You can set a pivot point relative to which the selected nodes will be transformed. Inverse selection can be useful for complex selections. 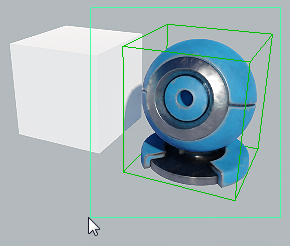 For example, if you need to select all objects in a scene except the specific ones, you can select these specific objects and invert the selection. To invert the current selection, press Ctrl+I. You can specify the position and rotation coordinates and the scale factor via the Parameters window. Choose the manipulator on the Positioning panel (or press W). Click the required node. The axes along which the node can be moved will be shown. If an arrow manipulator is dragged, the node can be moved along the axis. 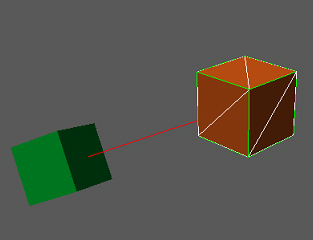 If a rectangle manipulator is dragged, the node can be moved by 2 axes. To move along the X axis, press left and right arrows. To move along the Y axis, press up and down arrows. If snapping by grid is disabled, the node will be moved over 1.0 unit. If enabled, the node will be moved with the specified step. Ignore the nodes' hierarchy when moving the selected node: press Alt and move the node without its children. Move the selected node to the camera by pressing Alt+X. Choose the manipulator on the Positioning panel (or press E). Click the required node. 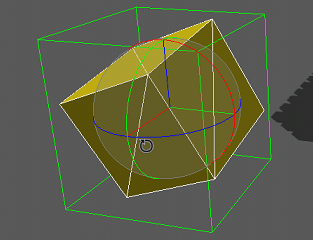 The sphere with the axes around which the node can be rotated will be shown. 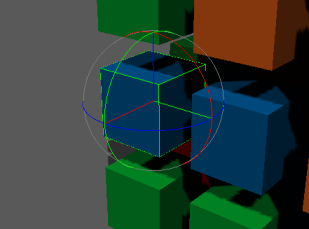 If an axis of the sphere is dragged, the node can be rotated around the axis. 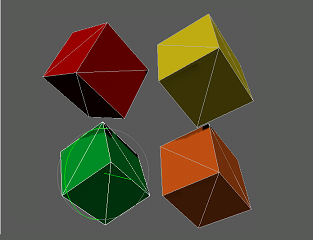 If the sphere is dragged, the node can be rotated freely around several axes. Enable snapping by angle and specify the step for the rotation angle. To rotate around the X axis, press up and down arrows. To rotate around the Z axis, press left and right arrows. Choose the manipulator on the Positioning panel (or pressR). Click the required node. The axes along which the node can be scaled will be shown. 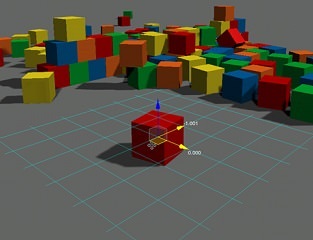 If a cube manipulator is dragged, the node will be scaled along one axis. 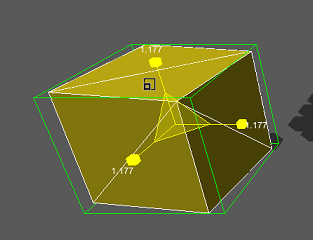 If a triangle manipulator is dragged, the node will be scaled along 3 axes. Move the cursor up and right to scale the node up. Move the cursor mouse down and left to scale the node down. Enable snapping by scale and specify the step. To scale along the X axis, press left and right arrows. To scale along the Z axis, press up and down arrows. Press Ctrl+D (or Edit -> Clone). The cloned node will have the same position as the source node. Choose , or on the Positioning panel (or press W, E or R). Press and hold Shift and transform the node. To delete a node, select it and press DELETE (or click Edit -> Delete Object). Transformations of the node are relative to the pivot point. The pivot point is used to control the way nodes rotate and scale. 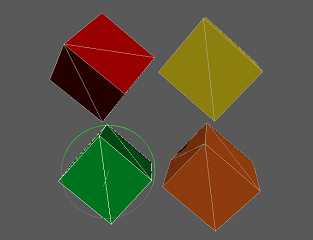 To rotate or scale several nodes, select them, choose the required manipulator and specify the position of its pivot point by using the pivot point toggle. If one node is selected, the pivot point position will not change when toggling. If the button is active, the pivot point will be set to the center of selection. If the button is active, the pivot point will be set to the center of the last selected node. To toggle the pivot point, you can press Z. If you scale the nodes, they will be scaled out from or in toward the center of selection. If you scale the nodes, each node will be scaled relative to its center. If the button is active, world space orientation will be used for the manipulator pivot point. The pivot point is oriented by the world space. The nodes have been rotated by 45 degrees around the Y axis. If the button is active, the coordinate system of the parent node will be used for the pivot point orientation. 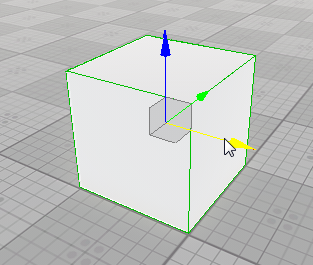 If the button is active, the pivot point will be oriented by the node local coordinate system. It means that its orientation will not depend on the parent node orientation. To toggle the manipulator basis, you can press Z. Snapping a node by the grid enables to position a node along the axis or over the grid with a given step (in units). Snapping should be enabled when moving the node by using arrow keys. If disabled, the node will be moved over 1 unit by default. Now you can move any node in the world by an axis or a grid with the given step. If one axis is chosen (an arrow manipulator is dragged), the node will be aligned by an axis. If a node is repositioned by two axes (a rectangle manipulator is dragged), the node will be aligned by a horizontal or vertical grid. 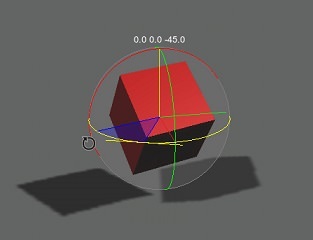 Snapping a node by an angle enables to rotate a node along the axis with a given step (in degrees). Snapping should be enabled when rotating the node by using arrow keys. Choose on the Positioning panel (or pressShift+E). 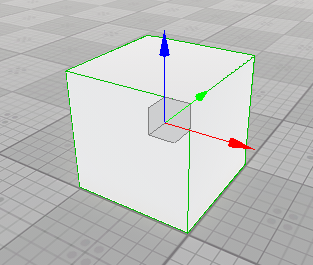 Now you can rotate any node in the world around the axis with the given step. Rotate one of the nodes. 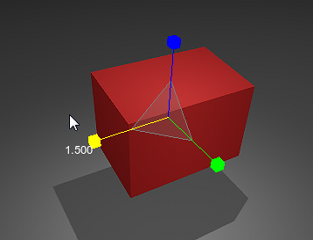 Snapping a node by the scale enables to scale a node along the axis with a given step. Snapping should be enabled when scaling the node by using arrow keys. Choose on the Positioning panel. Now you can scale any node in the world along the axis with the given step. Scale one of the nodes. 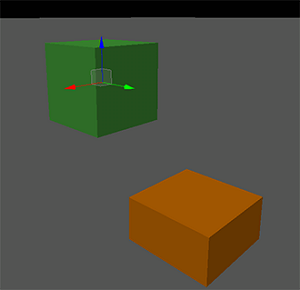 Snapping a node to a surface of another node provides pixel-perfect positioning of the nodes relative to each other. Select a node that should be snapped. Choose on the Positioning panel (or press Alt+W). 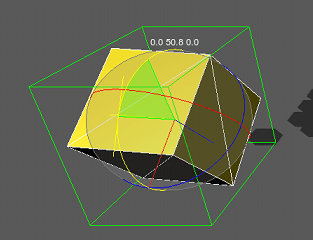 Offset from surface Specifies the distance from the node's pivot point to the surface (in units). To increase/decrease the distance to the surface, use the WHEEL UP/WHEEL DOWN hot keys. To reset the distance to the surface, use the MIDDLE CLICK hot key. 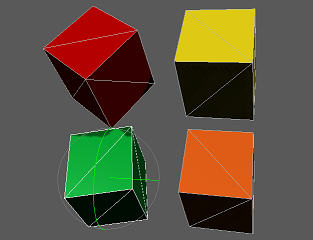 Orient by normal Specifies whether the node should be oriented by the surface normal or not. 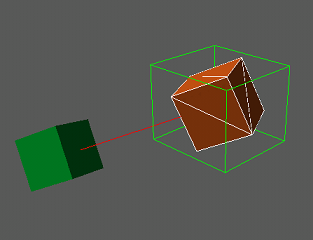 Move the node until the red stripe intersects the required surface of the other node. Click the left mouse button to place the node. To abort placement, press ESC. 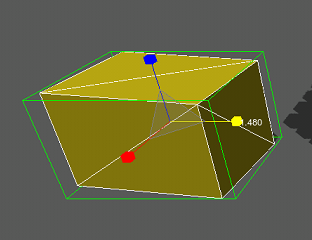 Dropping a node to the ground means positioning the selected node to the surface below this node. Select a node (or several nodes) that should be dropped. Put the cursor over on the Positioning panel. 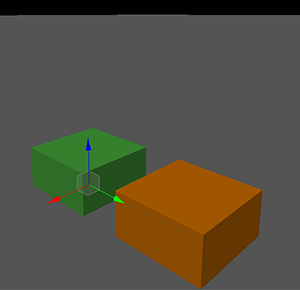 Intersection mask Sets an intersection mask that defines whether a node (or nodes) will be positioned on a surface to which it is dropped. 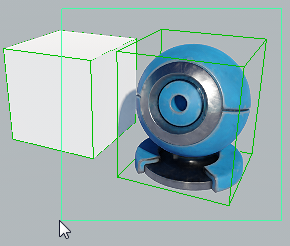 A node will be positioned on a surface if they both have matching intersection masks. Otherwise, the node will penetrate the surface. Click to drop a node (nodes).